Bespoke jewellery for Christmas gifts – Last chance to order! If you want an awesome, beautiful, bespoke jewellery christmas gift, you need to order it from me before 30th November! I also wanted to share with you this unusual order I had recently. My mum was never the one to wear loads of jewellery, she has a few pieces with sentimental value and wears them most days. Each piece is special to her and has a specific meaning. When she asked me to design her a new piece for her collection which reminded her of a ring she inherited from my grandfather, I was very keen to make this bespoke piece for her. It would have a double meaning, reminding her of my grandfather as well as me. The original ring had two diamonds set in the centre and a twisted diamond set shank. 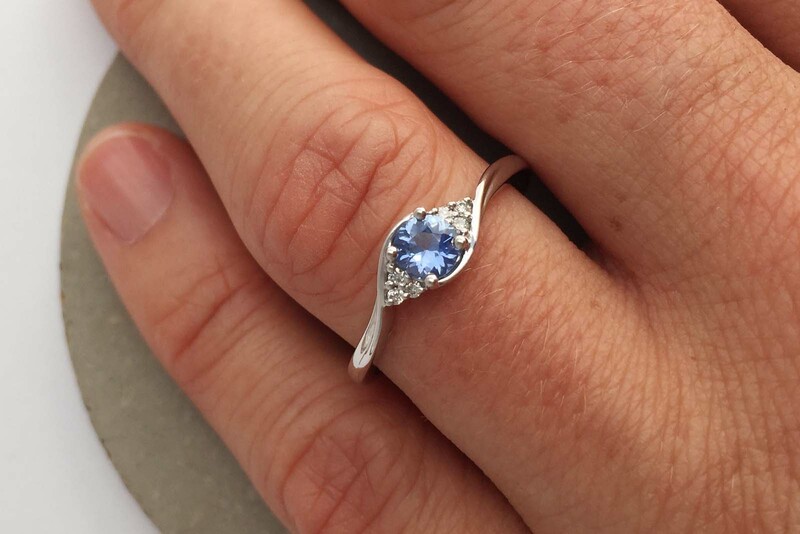 She wanted to keep the twisted look of the ring but make it simpler and with a blue sapphire as a centre stone. I actually quite love it as an engagement ring or promise ring as well. It has been one of my favourite commissions to make. Possibly because it has a personal connection to me but also because I love blue sapphires. I think they look like a segment of the universe has been cut off and hidden inside glass. It’s so beautiful. I worked from pictures and memory to make this ring similar to my mum’s original bespoke engagement ring. But more sparkly and new, of course. The good news is, my mum loved it! Her new ring reminds her of the original and is sparkling like new. This ring is shinier than the original (my grandad’s ring had lost its sparkle after years of wear – learn how to look after your precious jewellery here). She absolutely loves her new ring and wears it all the time. If you need a replicate made of some of your precious jewellery, perhaps you’ve lost a family heirloom or a special gift, get in touch. As I’ve said before, I love helping people and I love bespoke commissions. You just need to send over a photo and I can re-create your sentimental jewellery. And finally, don’t forget, if you’re thinking of getting some bespoke jewellery made for Christmas gifts, get in touch before 30th November! That’s if you want to receive it in time for Christmas day. Maybe you’re thinking of doing a surprise Christmas proposal? My next blog will be full of ideas about how to propose to your partner at Christmas. That’s it for now from me! Stay tuned for more!